The SMAP (Soil Moisture Active & Passive) Validation project is funded by NASA with collaborators from the University of Colorado at Boulder and UCAR. The purpose of the SMAP Validation project is to provide an independent means to validate the results of the SMAP satellite mission using GPS signals received at ground-based sensor sites. Continued research with GPS data will also help refine the algorithms and science products used to determine soil moisture content at the Earth's surface from a growing number of GPS sites in North American and around the World. 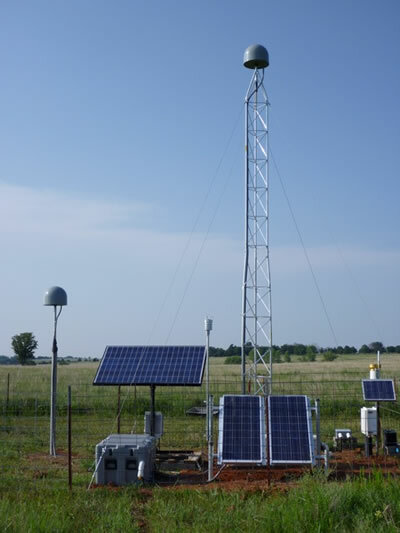 A field trip in May 2010 established four new GPS sensor sites at an ecological research station near Stillwater, Oklahoma. The sites are co-located with in-situ soil moisture sensors and various meteorological instrumentation for ongoing experimentation. Three of the GPS antennas were mounted on 2.5 meter masts to provide reception of GPS signal reflected from a broad footprint at each site. A single 6 meter tower was also constructed at one site to extend the areal extent of ground-reflected signal reception. Each site contains a NetRS GPS receiver with a choke ring antenna, solar and battery power systems, communications equipment, and an enclosure. The sites were engineered to withstand potentially extreme wind and lightning storms that occur in the area. Data from the four sites will be telemetered via radio and internet to the UNAVCO data center for use by researchers and archived for the duration of the three year project. Figure 1 - SMAP GPS validation site with 2.5 meter and 6 meter antenna monuments.